A space telescope has discovered a planet that spins wildly on its axis, resulting in rapid and erratic changes in seasons, NASA scientists say. The planet spotted by the Kepler telescope — designated Kepler-413b — precesses, or wobbles, wildly on its spin axis, much like a child’s top, NASA’s Jet Propulsion Laboratory in Pasadena, Calif., said Tuesday. The tilt of the planet’s spin axis can vary by as much as 30 degrees over 11 years, JPL scientist said. In comparison, Earth’s rotational precession is 23.5 degrees over 26,000 years. That this far-off planet is precessing on a human timescale is very unusual, they said, and it is also uncommon in that it is circling not one, but two stars — a pair of orange and red dwarf stars. Kepler spots planets by noticing the dimming of a star or stars when a planet transits, or travels in front of them. Normally, planets transit like clockwork, but the wobbly character of Kepler-413b causes it orbit to move up and down to such a degree it sometimes does not transit the stars as viewed from Earth, astronomers said. The next transit visible from Earth’s point of view is not predicted to occur until 2020, the researchers said. 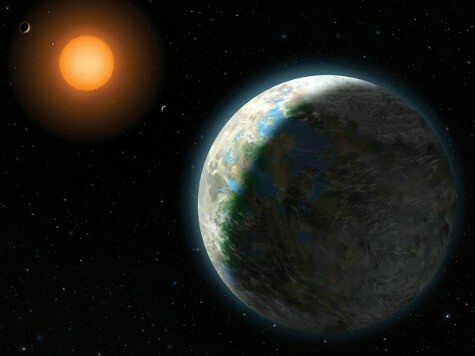 Even with its changing seasons, Kepler-413b is too warm for life as we know it, they said, because it orbits so close to the stars, its temperatures are too high for liquid water to exist, making it inhabitable.